This week in my Tolkien class we arrived at Rivendell, where Frodo and company have a well-deserved rest. I introduced our discussion of Rivendell by positing to the class the significance, indeed the necessity of periodic safe havens in adventure narratives—and the more harrowing the adventure, the more important it is for the protagonists to have occasional respite, for it is a respite for the reader/viewer as well. The emotional relief of momentary security balances the anxiety, fear, or terror to which we and our heroes are otherwise subjected. Of course, part of the emotional and thematic power of safe havens is the certainty of their ephemerality: either (1) we know our heroes will be obliged to move on sooner rather than later, (2) their safety will inevitably be breached, or (3) the safe haven isn’t quite as safe as first imagined, because those with whom we share it are themselves a threat (any fellow zombie film aficionado will be intimately familiar with this last one). Nevertheless, the ability to pause and take a breath comprises its own odd form of catharsis. The most striking example of this, for me, is in Cormac McCarthy’s bleak post-apocalyptic novel The Road, possibly one of the most harrowing books I’ve ever read. A father and son (simply referred to as the Man and the Boy) travel across a blasted landscape that makes Mordor look like the Salinas Valley, avoiding cannibalistic gangs and searching for sustenance. Around the middle of the story they discover a Cold War-era bomb shelter, stocked with imperishable food and boasting beds with clean, warm blankets. My relief when they made it to this temporary safety would have been comical if it wasn’t so deeply felt. Frodo waking in Rivendell to Gandalf’s voice isn’t quite the same thing, but there is a similar degree of relief, amplified by the idyllic quality of Rivendell itself—“a perfect house,” Bilbo had once said, “whether you like food or sleep or story-telling or singing, or just sitting and thinking best, or a pleasant mixture of them all.” Simply being there “was a cure for weariness, fear, and sadness.” Perhaps more importantly, it comes to feel to Frodo like home, not least because he is reunited with Bilbo, and because he allows himself to believe that his task is done. Just before he volunteers to carry on as Ring-Bearer, “An overwhelming longing to rest and remain at peace by Bilbo’s side in Rivendell filled his heart.” It is telling that, on imagining his burden has passed on, he does not think of returning to the Shire, a fact that anticipates his later emotional distance when his task is truly done, and his decision to leave Middle-Earth forever. (I suppose I should have prefaced that with “Spoilers!”) His apparent inability at that point to take pleasure in the Shire and in his post-Ring life deeply bothers Sam, for whom the Shire was always the beloved home to which he desired to return. That Frodo never really returns is, perhaps, first hinted at while he is in Rivendell. Frodo looks out at Rivendell in The Fellowship of the Ring. Home and its different conceptions and figurations are a crucial theme in The Lord of the Rings; which is perhaps utterly unsurprising, considering that home—or a point of return, at any rate—is a crucial element in most quest romances, that space of safety from which the hero journeys into the space of adventure. Certainly, that was its thematic role in The Hobbit. We learn a lot less of the Shire and its denizens there, as Bilbo is thrown into his adventure with unseemly haste. In Rings, it takes the hobbits five chapters to get a leg on and finally depart, and in the process we learn a lot more about it, its qualities, its people. In The Hobbit, the Shire is what Bilbo thinks of wistfully while sleeping in the rain or skipping yet another meal. In The Lord of the Rings, however, we learn enough about the Shire to have a deeper sense of its worth and its meaning, and it becomes one of several figurations of home. Why is this at all significant? Well, aside from mere curiosity, I’d argue that home as an idea and a reality as we understand it in the novel is connected to Tolkien’s figurations of power and magic. In a novel that is otherwise exhaustively detailed with regards to the history, mythology, and languages of its various peoples and societies, the nature of magic remains infuriatingly opaque. Tolkien does not deign to outline the laws and nature of magic as practiced by Gandalf, Elrond, or Sauron; aside from a few instances when Gandalf sets things on fire, magic appears as a nebulous, usually unseen force. Such coyness on Tolkien’s part sets him apart from those who followed him: fantasists such as Ursula K. Le Guin, Patrick Rothfuss, J.K. Rowling, and Lev Grossman turn magic into something that, while there must needs be an inborn talent for it, must be exhaustively studied and practiced. Each of the writers I mentioned incorporate magical schools or universities, where the students must commit thousands of details to memory and pass rigorous examinations. Gandalf has something interesting to say to Frodo not long after he wakes up. When Frodo asks him if Rivendell is safe from Sauron, Gandalf replies “Indeed there is a power in Rivendell to withstand the might of Mordor, for a while: and elsewhere other powers still dwell. There is power, too, of another kind in the Shire.” Given that he doesn’t go on to say anything more about the Shire and what it’s “other kind” of power is, it’s an interesting comment. Obviously, the Shire is by no means as powerful as Rivendell or Lothlorien; and as we discover at the end of the novel, it was by no means prepared to repulse even the assault of a deeply weakened Saruman. But there is power there: in class this week, we queried why the Nazgul are so much less fearsome in the Shire and Bree? At the Council of Elrond, Boromir describes the rout of Gondor’s forces: “[It] was not by numbers that we were defeated. A power was there that we have not felt before … Some said it could be seen, like a great black horseman, a dark shadow under the moon. Wherever he came a madness filled our foes, but fear fell on our boldest, so that horse and man gave way and fled.” Later on, we will see such fear deployed as the Nazgul’s main weapon—but while they are still Black Riders in the Shire, all they seem to do is creep out Frodo’s neighbours. In Bree, they become somewhat more menacing, actually attacking what they think are the hobbits in their beds—only to discover that they have been deceived by the illusion of pillows and bolsters underneath the bedclothes, in a ruse that could have been devised by Ferris Bueller. See? You can hardly tell the difference. On one hand, it is tempting to think that Tolkien wasn’t sure who these villains were just yet when he wrote them. On another hand—and this was the class consensus—perhaps they lack the power they show elsewhere (such as the attack at Weathertop) while in a place of community. In both the Shire and Bree, they are objects of fear and suspicion—very obviously outsiders and strangers. It could be argued that they preferred stealth at such moments; but it could also be argued that, well, they’re Ringwraiths! Who needs stealth? Except that Gandalf tells Frodo that the Shire has its own kind of power. He does not, of course, elaborate on what the nature of that power might be, but the fact that he feels compelled to mention it at all is significant. In contrast, Rivendell and Lothlorien are idyllic expressions of their masters’ benign power. On the first leg of their journey from Rivendell, the Fellowship reaches the land of Hollin, which used to be called Eregion when Elves dwelled there. Though they have been gone from the land for several thousand years, it is still a fair and pleasant place. Gandalf notes that, “There is a wholesome air about Hollin. Much evil must befall a country before it wholly forgets the Elves.” By the same token, the Shire is the embodiment of hobbit-society: pleasant, complacent, well-tended, and eminently comfortable. It is in the experience of Rivendell however that Frodo and company have their first real encounter with the power of place. Rivendell—Imladris, in Elvish—is referred to as “The Last Homely House” (variously, “The Last Homely House East of the Sea” or “The Last Homely House West of the Mountains,” which tells us pretty emphatically that it is the only Homely House, at least on this latitude). In the first draft of The Hobbit, Tolkien initially refers to Rivendell as “the Last Decent House,” though he changes his mind about a page and a half on and changes “decent” to “homely,” and makes a marginal notation beside “decent” to change it later. The change is a sensible one, as “decent” conjures up connotations on one hand of moral propriety, and on the other of a certain snobbishness (as in “there’s no decent hotel in this city”). But “homely”? Why? It’s obvious we can dismiss our common contemporary understanding of homely as blandly unattractive (assuming Rivendell didn’t earn that name for poor design choices). It’s also obvious that the term can be understood, in part, as “homey,” but it does seem odd to call the home of Elrond Halfelven, son of Earendil the Mariner, “homey,” however much it might be so. Besides the obvious alliteration, why “homely”? 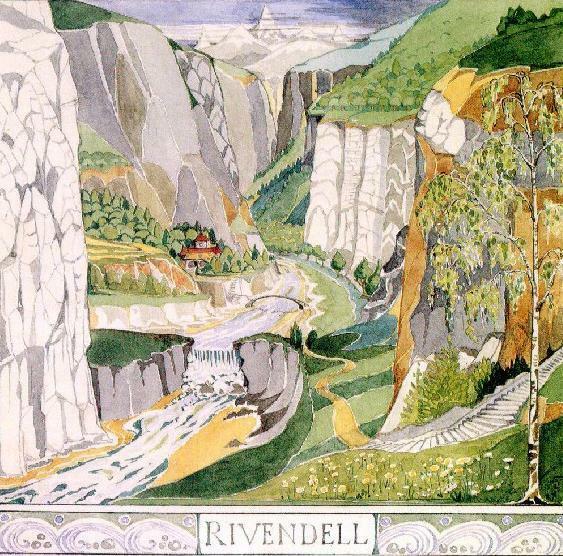 Tolkien’s own illustration of Rivendell. “Homely” as it turns out is a far more textured and loaded term than one might at first assume. According to the Oxford English Dictionary, it comes to us by way of German and Dutch. Heimlike is Middle Dutch for belonging to a household or a home; hemelik is Middle Low German for “friendly or intimate”; and heimlich is Middle High German meaning either “belonging to a person’s own country” or “familiar and intimate.” So far, nothing surprising—all of these definitions are in line with “at home with” or other such uses of “home” to designate a place of safety and comfort, in which individuals sharing that space similarly share intimacy. Freud’s explication of the uncanny is largely focused on this seeming paradox, wherein heimlich and unheimlich come to have a significant semantic overlap. His thesis, moving beyond the simplistic understanding of the uncanny as merely weird and unfamiliar, posits that the unheimlich, the uncanny, has as much to do with revelation as it does with the unfamiliar. That is to say, the revelation of what is private and hidden; and most crucially, that which is hidden from the self as much as from others. But what, you might ask, does this have to do with Rivendell? Quite a lot, I would argue. Tolkien might not have had much use for Freud, but he certainly had a lot of use for the OED (working as an editor on it was one of his first academic jobs), and one has to assume that given “homely’s” affinities with and roots in Germanic languages, he would have been well aware of its variegated meanings. Rivendell embodies both meanings of heimlich, in terms of its hominess, familiarity, and comfort—but also in terms of its secrecy and concealment. It is literally concealed, hidden among the valleys of the Misty Mountain foothills. This quality is less obvious in The Lord of the Rings, as Frodo is unconscious during the last leg of his journey from the Ford of Bruinen to Rivendell itself, and so has no memory of the hidden trail—unlike Bilbo’s experience In The Hobbit, in which the way to Rivendell is depicted as extremely tricky, with even Gandalf not entirely certain of his route. But Rivendell is also a place of concealment and secrets in a variety of other ways, not least of which is what it hides from the eye of Sauron: most prominently, Elrond (spoiler), as we discover in the final pages, is the wearer of one of the three Elven-Rings; Elrond’s ring however we can also read as representative of the practices and qualities of Elven-magic—felt but not seen, sensed but not grasped by those who are not themselves imbued with such power. Though Rivendell is advertised as the “Last” Homely House, we encounter a similar space when the Fellowship arrives in Lothlorien—and there the uncannier qualities of magic and power are more forcefully felt. Indeed, one of the significant moments of those chapters comes when Galadriel meets the gaze of each of the Fellowship in turn: “And with that word she held them with her eyes, and in silence looked searchingly at each of them in turn. None save Legolas and Aragorn could long endure her glance. Sam quickly blushed and hung his head.” Sam admits later that “She seemed to be looking inside me and asking me what I would do if she gave me the chance of flying back home to the Shire with a nice little hole with—with a bit of a garden of my own.” The rest of the company uneasily admits to having been similarly tempted; Sam’s embarrassed discomfiture, to my mind, perfectly expresses that aspect of the uncanny in which something previously hidden is revealed to the self. Galadriel’s test (which is turned around on her when Frodo offers her the Ring) is uncanny precisely because it makes explicit repressed desire to the self. That Sam’s unheimlich moment was precisely a desire for home articulates the way in which Tolkien’s figurations of home and power are really rather complex, if not in fact fraught. I’ll end this post here, as it has grown well beyond what I had originally intended. Suffice to say, this particular thesis is still embryonic but evolving. I will continue this line of inquiry, as promised, with a post about what that “other world” I mentioned earlier might entail. Na lû e-govaned vîn, novaer. 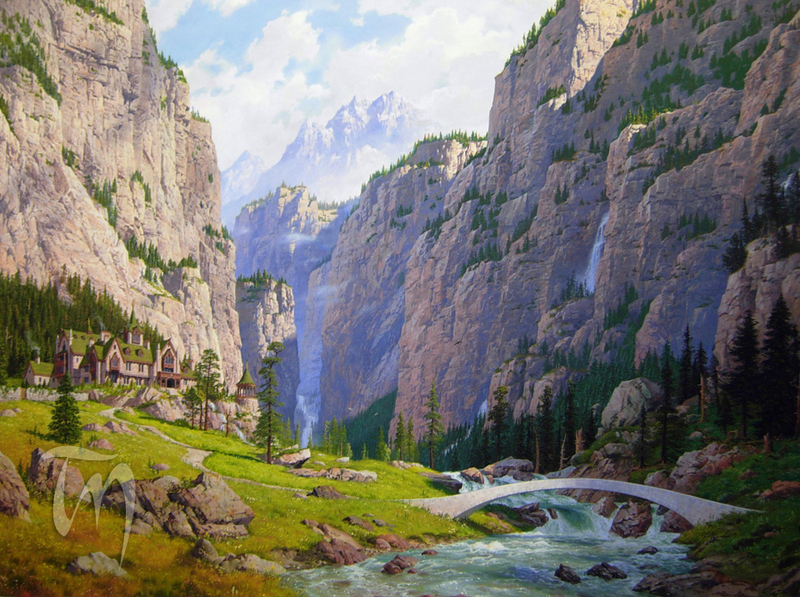 Rivendell as illustrated by Ted Nasmith.